My birthday came and indeed it was one of the best birthday I ever had yet. My friends surprised me with a basket of chocolates (which I really love!) and a compilation of greetings/messages from random (I mean friends) people and what made that day special is when I celebrated it together with my family. That’s more than enough. Well, I thought that’s the beginning of my awesome days but it seems everything turns 360. Final exams are out, feasibility studies defense are coming, a lot of requirements are still to be done, sleepless nights are already part of the cycle. My mind still shouting to finish it well but it seems that my body wants to gave up already. A lot of things were being compromised, patience becoming shorter, time for my family, time for my self and even my personal time with God are being set aside. And yes i’m still on half way but I already messed up. In a twinkle of an eye, the heaven pop-up in my mind, the place where there’s no more weeping, no more suffering, no more hurt and pain, no more burden to carry. How I wish to go there right now. I can’t stop but to let my tears to fall down, I can’t take this anymore. I really need God. I need to talk to God. After a moment of tears, a piece of silent with God, I am now relief. Truly, God reminded me a lot of things to cherish and even things that need not to perish anymore. It is true and I can’t deny that there’s a lot of things to complain, a lot of things to struggle, a lot of burden to carry, a lot of situations to handle and even a lot of people and relationships that need some attention. It just a matter on how we’ll going to respond on it. God reminds me that I can’t handle all those stuff alone, I’m just a human. All I need is someone who is able to carry those stuff, that someone who really cares for me, and that’s no other than Him. 1 Peter 5:7 says,“Cast all your anxiety on him because he cares for you.” I’ve realized that I’m just tired and all I need is to rest but how? God answered me through Matthew 11:28, here it goes,“Come to me, all you who are weary and burdened, and I will give you rest.” Hooray! What more can I say? Despite of those circumstances that coming into our lives, I still believe that there are more things to be thankful for. There are a lot of people out there who just took their last breathe last night and I really thank God simply because I’m still breathing right now. Whatever happened yesterday and is happening today, I learned to be grateful because there’s such thing we called tomorrow. I thank God for the so-called life. A brilliant life. 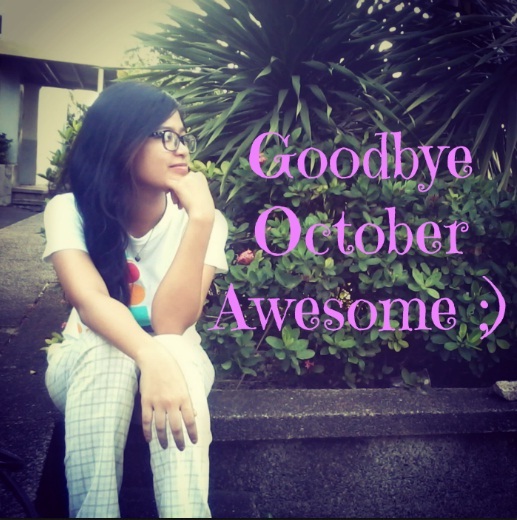 I was supposed to publish this blog on the last day of October but I didn’t made it. Oh well never mind. Have a great November days ahead anyway! Tomorrow’s gonna be harder but let us become much stronger together with the creator of the universe, by his love and power we’re able to conquer everything.